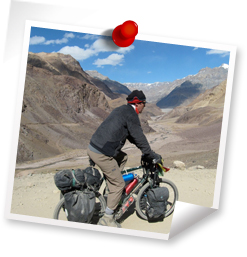 There is no better place than Ladakh for cycling enthusiasts as there are so many trails which offer wonderful vistas of Desert Mountains, hilltop monasteries, surrounded by snow clad mountains and charming landscape. Bike tours also provide unique opportunity to interact with local people passing through their villages. Ladakh is a perfect destination for cyclists who not only want to have fun ride but do not mind a bit of challenge with excitement of climbs and steep downhills. At an altitude of 3500 metre and above. You will come across sharp turns on mountain roads on windy passes which may be strenuous but a real thrill. You may choose from a day or a couple of days cycle tour on easy trails or a truly adventurous ride across famous Himalayan passes such as Taglang La Pass at 5280 metre, The Lachalung LaPass at 5065 metre, the Baralacha La Pass at 4995 Metre, and Rothang LaPass at 3990 metre. This will be an experience which you will never be able to forget. If you are passionate enough and have the mettle for an exciting tour, our 13 Nights/14 days cycling tour package, to have bold experience in the cool habitat of North India. Our tour package includes a fascinating Leh-Ladakh Tour following the tour map of Delhi- Chandigarh-Manali-Marhi-Gondla-Jispa-Zinzanbar- Pang- Lipsa. Upon arrival in Delhi meet our representative at the airport and he will take you to the hotel. Delhi is the capital city of India and is regarded as the heart of the nation. The city is popular for its enriched culture and heritage. The city boasts of famous historical monuments. We will be visiting the main attractions that will include the Rashtrapati Bhavan, Birla Mandir (Lakshminarayan Temple), and India Gate. Also visit an astounding piece of architecture from the Mughal era – The Humayun Tomb. Overnight stay. Start your journey from Delhi to Manali by car/coach. It will be a long drive and may take more than 12 hours. Arrive Manali late in the evening and upon arrival check in at hotel for overnight stay. Our guide you hand over your bikes and prepare yourselves for the adventure ahead. Manali is situated in the beautiful Kullu Valley, which holds a cultural and religious significance as the home of saptarshi (seven sages). The trout-filled Beas River gurgling down the mountains, Scenic hills dressed in lush green attire and spellbinding valleys scented with the smell of pines; all of them complement each other in the perfect manner to create the magical realm of Manali. What could be a more perfect place to go for a test ride on your respective bike and get used to the cuts and curves of this hilly area. Overnight stay. After breakfast, gear-up for first ascent on all-new cycling adventure as we warm up for more difficult tour ahead. It is going to be a scenic pedalling through pine and Deodar forest on the way to Marchi. Overnight stay. After breakfast we shall start cycling uphill to reach Rohtang la pass at an altitude of 3978m. This will be the first among many other passes in Ladakh. It will bea great experience of nature in one of its rawest forms possible, amongst mountain peaks covered with snow, breathtaking view and magnificent and sprawling landscapes. We descend to the road surface witnessing stunning scenery. After reaching the valley floor, we move ahead towards Gondla by the River Chenab. Overnight stay. We precede our journey to Jispa from Gondla through Keylong on a flatter road surface favoring you to take pleasure in the surroundings without getting much tired. Today, it may be tiresome peddling as we head skyward from Jispa to Baralacha La. Situated at an altitude of 16,040 feet, Baralacha La Pass is a high mountain pass in the Zanskar range in Jammu and Kashmir. It is a high plateau where three different mountain ranges – Pir Panjal, Zanskar and the Great Himalayas – meet at an altitude above 16,000 feet. Overnight stay. Enjoy the stunning views of Lingti valley and after few kilometres of flat ride, the road heads dramatically upwards via ‘Gata Loops’ a series of 21 consecutive hairpin curves and bends totalling to a 20 km climb to the up hills of Lachlung la 5050 m up – a achievement worth a reward! We shall come downhill to Brandy Nala, that is acclaimed for army stock up supplies. Starting at Rupsu plain, the trek traverses the barren high plateau, high passes. A delight for nature lovers, the trek offers exiting landscape, wild animals like marmots, thar and many varieties of birds. Today will be a relatively relaxed day as we leave for Pang which is a beautiful valley. Pang is the place where the highest army transit camp exists. It was earlier a stop primarily for Indian army but now it has become a stop for tourists as well. The scenery of this place is breathtakingly. Being a high altitude remote region, you will enjoy the vistas of nature without disturbance. Overnight stay. Today is a special day as you will reach bae camp of one of the highest mountain passes. The Tanglang La pass is known as second highest motorable mountain pass in the world. It is like passing through the clouds as they are so close to you. The journey will mesmerize you and it will be an unforgettable experience. Overnight stay. The adventure reaches at its peak as we scale up Tanglang la, nestled at an altitude of 5328m above the sea level, in the Zanskar range, Taglang La pass is the highest spot of our journey which also requires hard peddling up the hill. The pass provides for a scenic view as it sways away from the main highway. Another descends towards Upshi along a more fertile and greener and treks will take you to Upshi. Overnight stay. The riding becomes easier with the last of the lofty passes now conquered. En route, stop breaking the journey at one or two fascinating monasteries, or ‘Gompas’. We finish the day in legendary city of Leh- a paradise on earth perfect place to recover from the journey to get there! Overnight stay. Breakfast at the hotel and you will be transferred to airport or any other location in Leh.